Sleeping Beauty Castle Fantasyland landmark at Disneyland. On opening day, the drawbridge was lowered for the only time until the new Fantasyland opened in 1983. In order to use wasted space, the interior of the castle was opened as a walk-through attraction featuring dioramas telling the Sleeping Beauty story on April 29, 1957, with Shirley Temple making the dedication. The interior was expanded in 1968 and redesigned in November 1977. It has been questioned why Walt Disney built the castle relatively small (it only rises 77 feet above the moat), but he actually had a very good reason. He recalled that the tyrants in Europe built huge, imposing castles in order to intimidate the peasants. 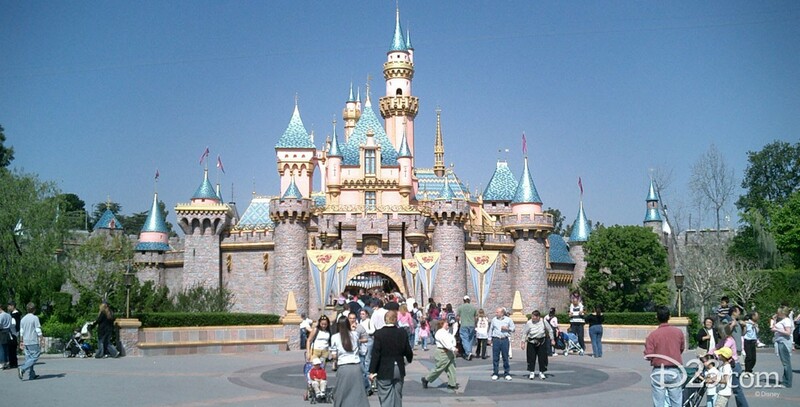 Walt wanted his castle to be friendly, so it was built on a smaller scale. While it looks in many ways similar to Neuschwanstein castle in Bavaria, actually a number of medieval European castles provided a model for this one. The faux building stones give a forced perspective, making the castle seem larger than it is, with larger ones at the bottom and smaller ones above. After his death a few years ago, a tree was planted in front of the castle in honor of Herb Ryman, the Disneyland designer extraordinaire, who was responsible for much of the look of the castle. The walk-through attraction was redesigned and upgraded, and reopened to guests in December 2008. At Hong Kong Disneyland there is a Sleeping Beauty Castle patterned after the one at Disneyland. See also Le Château de la Belle au Bois Dormant for the Disneyland Paris version.